FCC to Allow U.S. Telecom Services to Cuba. 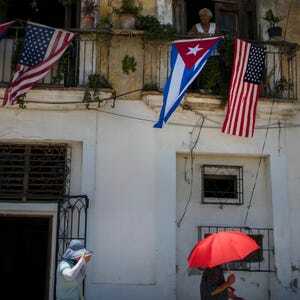 The Federal Communications Commission said Friday it has removed Cuba from its “exclusion list,” allowing U.S. companies to provide telecommunication services to the Caribbean country without separate approval from the agency. Cuba was the last remaining country on the FCC’s exclusion list. “Removing Cuba from the Exclusion List benefits the public interest as it will likely alleviate administrative and cost burdens on both” telecom companies and the FCC and fuel more competition among telecom carriers interested in the market, the agency said. The move has been anticipated following the Obama administration’s decision in late 2014 to reopen diplomatic relations with the island nation. At the time of the dramatic announcement, the U.S. government said telecommunications companies will be among the first industries to to set up equipment and other infrastructure projects needed to begin their services. In September, the departments of Commerce and Treasury followed through by removing a series of restrictions on Americans traveling to and doing business with Cuba. The changes, ranging from investment to banking to joint ventures, enabled American businesses to establish a “physical presence” in Cuba and hire Cubans to work in their offices. The U.S. economic embargo on Cuba remains in place since only an act of Congress can lift it. Cuba is a largely untapped market that is hungry for expanded wireless phone and Internet services. In June, 2013, Cuba extended access to its new high-speed internet to citizens at designated, censored ‘cyber points’ “at prices few can afford,” according to advocacy group Freedom House. Only about 5% to 26% of Cubans have access to the Internet, it said. In September, Verizon Wireless said it became the first U.S. wireless company to offer roaming in Cuba through its “Pay-As-You-Go International Travel” option, which costs $2.99 per minute for calls and $2.05 per megabyte for data. The State Department recommended in October that the FCC remove Cuba from the exclusion list, and the FCC began collecting public comments. Not surprisingly, the industry is supportive of the move. AT&T told the FCC “that removal of Cuba from the Exclusion List would help foster competition for bilateral communications between the United States and Cuba, and thus increase the flow of information to and from the Cuban people,” according to the FCC’s order for removing Cuba from the list. Medical device maker Medtronic said scrapping the reporting requirement will “promote connectivity for medical devices and services, such as remote monitoring of medical devices and exchange of medical information between the two countries,” according to the FCC order.